My mother in law (knowing my personality all to well) gave me The Tickle Monster Laughter Kit as a Christmas gift last year (which was only a few days after arriving home from the hospital with Noah!) 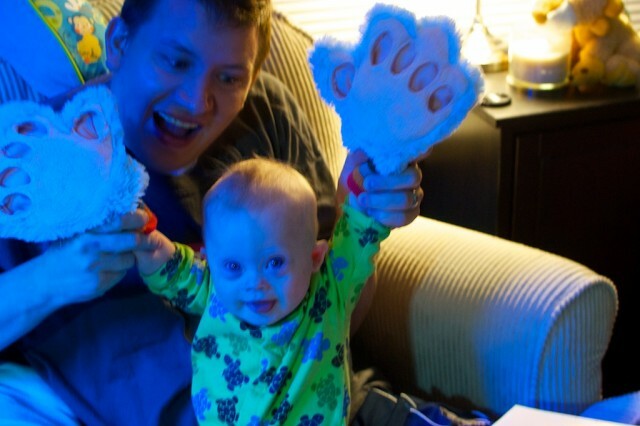 As soon as I unwrapped the package and slipped on the included Tickle Monster gloves I couldn’t wait to introduce Noah to the awesomeness known as The Tickle Monster….! What a great Christmas gift...! He may not like The Tickle Monster now...but he will! 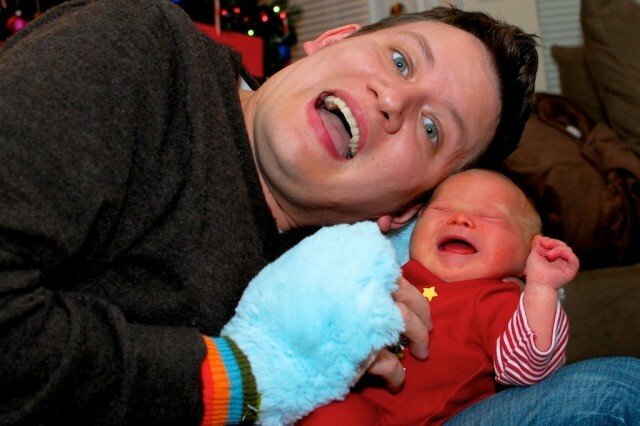 Baby Noah may not have been ready for The Tickle Monster at 2 weeks old, but he is now and I’m happy to announce the start of a wonderful friendship. It looks like The Tickle Monster will be a regular guest in our house..! I think he's changed his tune about The Tickle Monster! The Tickle Monster is interactive. We like to find books we can read with (not to) our son. One is passive. The other is interactive. When it comes to being a superhero parent to your children, interactive always wins. This books screams interactive. 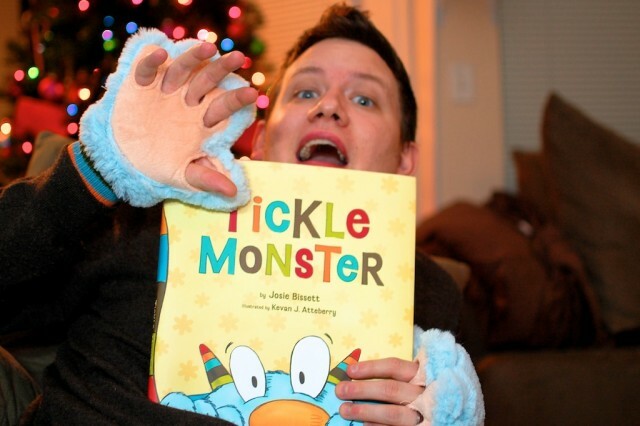 You just slip on the gloves and assume the role of The Tickle Monster. Which means you get to spend 20 minutes (or more!) watching your little one wiggle and giggle. Can you say awesome…? I can. The Tickle Monster is packed with colorful and fun illustrations. Sensory stimulation is very important for infants which is why they enjoy books with a variety of textures and bright, colorful illustrations (ever wonder why all of those infant toys are so loud with so many flashing lights…? Now you know!) Kevan J. Atteberry did an incredible job illustrating in this book (Think your favorite Pixar movie!) Your child (and you) will really enjoy taking in each page. Noah really enjoys running his hands across each of the Disney-like filled pages. The Tickle Monster is filled with great lines! 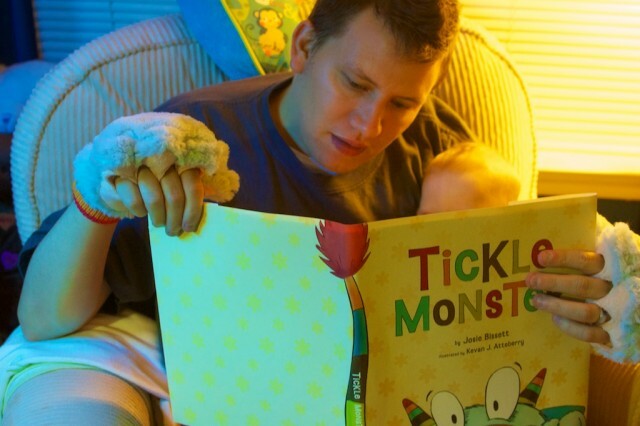 If you’re looking for something fun and new to read with your child, I highly suggest visiting Amazon and picking up The Tickle Monster as soon as you can. Don’t worry, you can still keep Goodnight Moon in your storytime rotation! The Tickle Monster is welcome anytime in our house. The Tickle Monster is a WIN in our house! Have you come across any interesting, or unique children’s books lately? Please let us know in the comments…we’re always on the lookout for new ones! When Noah was born seeing videos of what our life [could] be like one day when Noah was older was was very helpful for us, but the problem is there just aren’t many GOOD videos and info online. So we figured why not just make a resource ourself. And here is the result. that video is too precious! i will definitely have to get this storybook! i am sure Jo will enjoy it as much as noah does. Be sure to let us know if you end up picking it up, and let us know how Jo (and you) liked it. awesome! this is going to be my christmas present for everyone with kids! thanks! keep the ideas coming! Cindy, that sounds awesome! Let me know how they like it! Thanks for the book suggestion, we’ll have to check that out! It may make a good gift for our little Noah! My daughter loves those gloves. She wears them all the time…makes for great photo opps. We bought the book – didn’t remember about the kit. But love it! Can’t wait to read it to Enzo. There are so many books to read. Phew! Harrison also just got Tickle Monster for Christmas! My sons (Jamison, 2; and Harrison, 7 mos. tomorrow)and I LOVE this book! 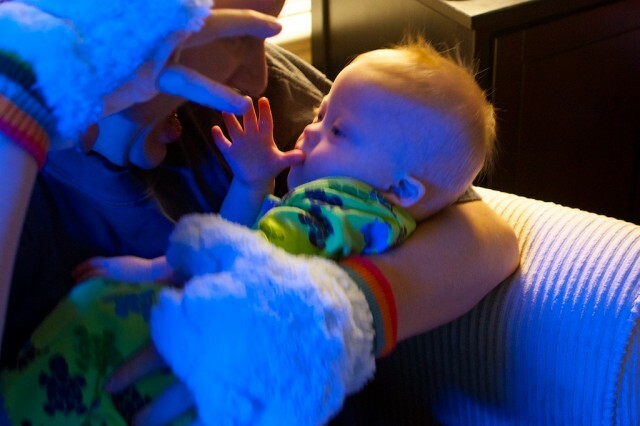 Harrison wore the same “Baby’s 1st Christmas” pjs as Noah did last year. So glad my friend introduced me to this blog! I will have to get that book. My son will love it! He is a lover of books, and this one will be a favorite I’m sure! Though these are for older kids, look into the I Stink and I”m Dirty books. They are about a trash truck and a loader. The author has some other similar books We also love a book called Where’s Bear? If you have any other book suggestions, please post them. Ohhhh…thanks for the suggestion, I’ll have to check that out. We’re always up for good books. We will have to add this book to our collection. 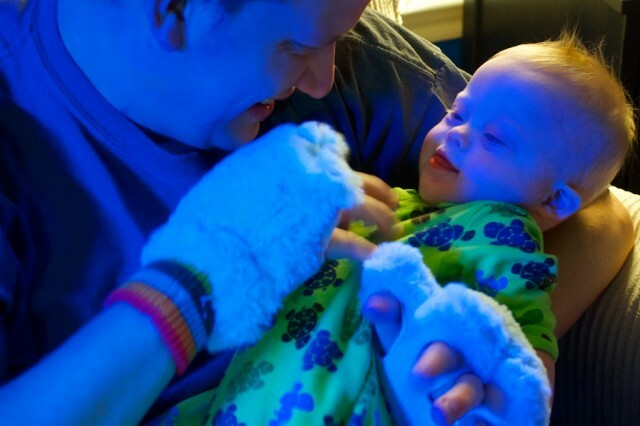 I love the photo of Noah with the gloves. Top favorite at our house right now is the pigeon series. (Don’t Let the Pigeon Drive the Bus!) Thank you so much for the blog/facebook, love seeing the pics of Noah.